For a grey seal pup, the first few days of life appear to be an insouciant affair. Lying with mum, whiskers fluttering in a sea breeze, watching waves lap ashore. But as the BBC launches a series of seal webcams - offering a unique opportunity to watch live footage of the animals as they breed on the coast of Scotland - new research published this month suggests that the life of a grey seal pup is anything but easy. Baby grey seals have to make a series of life or death decisions. And one of the most important is whether to suckle or swim. Grey seals (Halichoerus grypus) occur worldwide along the western and eastern coasts of the North Atlantic and in the Baltic Sea. More than 200,000 exist, with the majority occurring in the eastern North Atlantic, concentrating within the islands of Scotland, UK. Females tend to return to the same breeding sites year after year, and around 15% of the world's grey seal population breeds on Orkney, Scotland. Last year 5,000 pups were born on the beaches and rocky outcrops of the island of Stronsay alone. 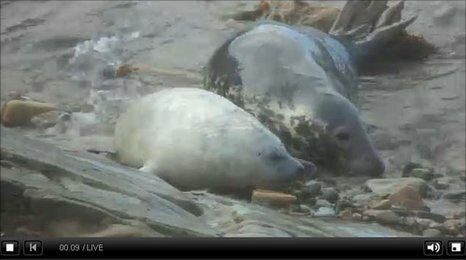 This year, BBC Autumnwatch is broadcasting this spectacle using webcams to beam back live video footage of a seal colony breeding on the beach at Stronsay. This live broadcast will continue for the next ten days, with wildlife cameraman Gordon Buchanan filming the creatures for the best part of a month. 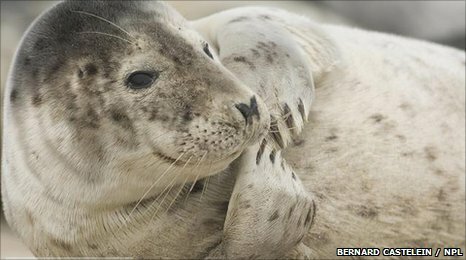 But it is another major colony of seals, which breed at Froan, Norway, which has revealed the dilemma facing young pups. Grey seal pups are born with a white coat, and feed on their mother's milk for about 15 days. After an abrupt weaning, by which time they have moulted their baby coat, they endure a fast lasting one to four weeks. During this time, they get most of their energy from their body fat. But scientists studying seals at a Froan wildlife reserve observed pups engaging in two distinct behaviours - both while they were still suckling and after they had been weaned. Around 40% of the pups studied spent their time ashore, scientists from the Norwegian University of Science and Technology and the Norwegian Polar Institute report in the journal Animal Behaviour. The other 60% of pups entered the sea during suckling and in the early post weaning period. These pups regularly dispersed to other locations within the breeding colony. Some of these more adventurous ones swam distances of up to 12km. The dilemma is very real. 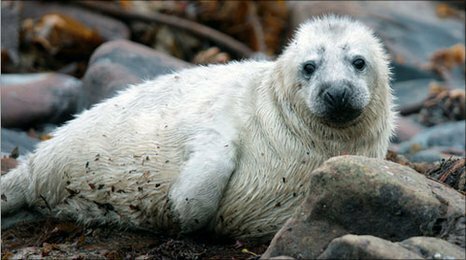 Starvation is reported to be a major cause of death among young grey seals in the UK. So it is risky for a pup to leave its mother - and its food source - and burn energy learning how to swim. Young seals are also exposed to colder temperatures in the water. They could surface or haul out at a different site, losing contact with their parent. But not learning to swim brings its own risks; seals that have not learnt to dive and forage may not be able to feed themselves as well during their first year. 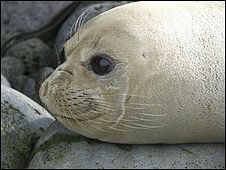 The scientists studying the Froan seals found that suckling pups that dispersed more than 2km had a significantly lower body mass than those that remained on shore, many of which suckled for longer. But the more adventurous pups later caught up in body weight, suggesting they were better placed to feed themselves. Such decisions influence the fate of individual pups and also the fate of the overall population. Recent research has found that grey seal populations can be self-limiting, fluctuating according to the density of seals in any given year. For example, the overall British grey seal population has been regularly monitored using aerial surveys for the past four decades. Until 1996, the population had been increasing at a rate of 5-6%, but between 1997 and 2001 the rate fell to 2.8%. It then continued to fall, growing by just 1.3% between 2001 and 2005, suggesting it was being regulated by some density dependent process. Studies on the Isle of May, Scotland point to what that might be. Scientists at the University of St Andrews, UK observed and then modelled the distribution of newborn grey seal pups. They found that the first breeding females to arrive generally lay their newborn pups close to the sea, but few closer than 10m to the point where they access the ocean. Later arriving females are then forced to give birth inland, some up to 100m further away from the sea. As more seals arrive it therefore becomes harder to find a suitable pupping site, which may limit the growth of the overall population. Aggression also plays a significant role, particularly within the most dense parts of the colony, between 20 and 60m from the sea. Here females are most likely to attack one another, with most aggressive encounters occurring close to freshwater pools. Grey seals are thought to use these inland pools of water to help cool their bodies and possibly for drinking. Follow the fate of the Orkney grey seals on Autumnwatch, broadcast on Thursdays, on BBC Two at 2030 BST. Or watch them live by webcam at BBC Nature UK, the online home of Autumnwatch.